No need to get out the vacuum! Dust bunnies are made for scattering all around the house. Soft and fluffy and packed with high test Zoom Around the Room organic catnip, they’re the perfect mouthful for your house skitterin’ cat. And don’t worry about leaving them out for visitors! 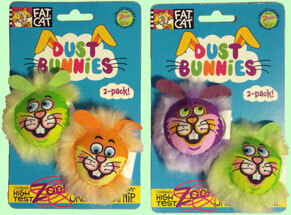 Even your mother-in-law will approve of these Dust Bunnies! Approximately 5 cm across. Assorted colours.